Saturday, 23rd March 1963. The new church is blessed. “Worthy of This Old Township” – Archbishop Grimshaw. The solemn blessing and opening of Bicester’s new Roman Catholic Church of Our Lady of the Immaculate Conception was conducted last Saturday by his Grace, the Archbishop of Birmingham, The Most Rev. Dr. Francis Grimshaw. 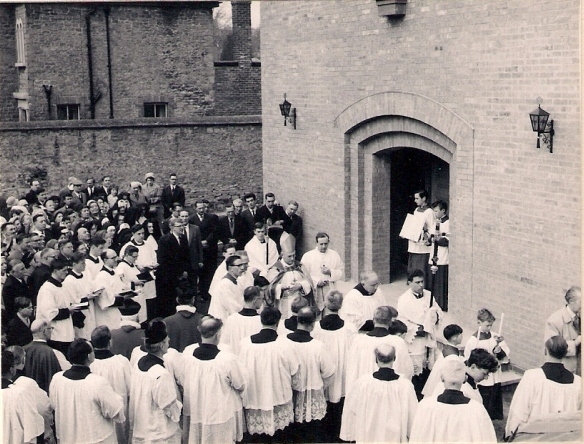 A large congregation gathered outside the Church to witness the opening ceremony. Attending the ceremony were representatives from various denominations: Coun, J. Leach, Chairman of Bicester Urban Council and Mrs. Leach and members of the Council and their wives; also present were Monsignors J. Gray and H. Foster, Canons P. Cassidy (Souldern) and M. Power (Stoke-on-Trent) and priests from all the parishes in the diocese. Nuns were present from various convents in the area. The hymns were sung by the Heythrop choir. The ceremony began just after 11 a.m. when the Archbishop, attended by the Rev. 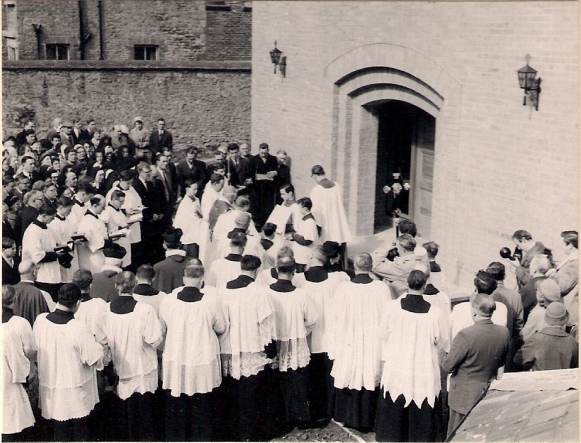 Philip Wyles (curate) and Fr. J. Davenport of Headington, Oxford walked round the outside of the Church blessing the walls. The procession now went inside the Church for the first time. 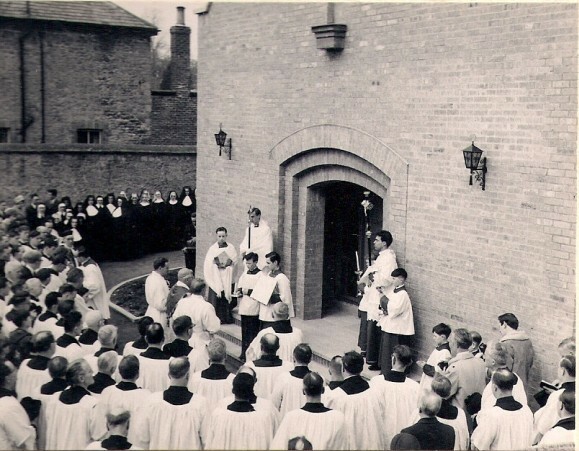 The congregation was then allowed to enter and watch the Archbishop blessing the inside walls of the Church and then down the centre and to the sides of the Church signifying the sign of the cross. Then followed Pontifical Low Mass celebrated by the Archbishop. The master of ceremonies was shared by the Rev. J. Cooney and the Rev. B. O’Brien (the Archbishop’s secretary). During the Mass the Rev. W.Ford, of Sonning Common, Nr. Reading, explained the service to the congregation. The Mass was the Mass of December 8th, the Feast of the Immaculate Conception. Archbishop Grimshaw addressed the congregation after the Mass and said that it was not long ago that he had walked around the foundations. He explained that the blessing with holy water, a symbol of purity, was older than Christianity itself. The consecration of the Church, he said, would not take place until all the debt was cleared and the work was completed. Referring to the recent Council in Rome when it was suggested that there should now be a simplifying of services, he said the Altar Missal he was using had all the up-to-date changes. He hoped the Church would be used so that people may understand what the Church was trying to tell them. The Archbishop attended a luncheon with members of the clergy and returned later to the Church to administer the Sacrament of Confirmation to 153 children from Bicester and district. The Sacrament of Confirmation was followed by full Pontifical Benediction. Bicester Advertiser, 29th March 1963. This Church, while it may be contemporary in design, has a certain odour of sanctity, which is felt immediately on entering the large wooden entrance doors. Estimated to cost £50,000, it was made possible by many fund raising efforts and contributions from the parishioners. There will of course, be a large debt spread over a number of years. The Rev. Fr. Foynes, parish priest said it has been a dream for many years to have a new Church. His predecessors had been trying for many years to have one built. 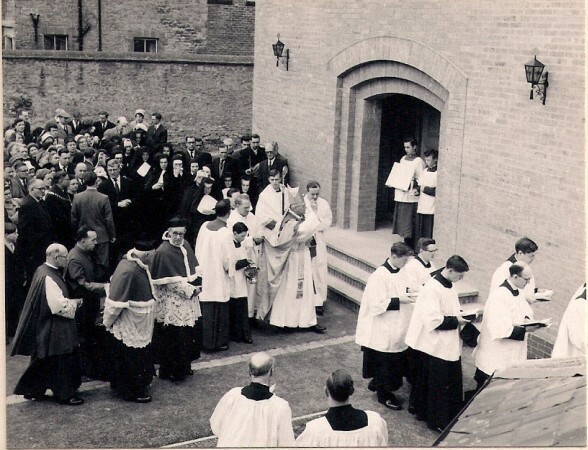 A new Church is very necessary now because of the growth of the parish, he added. The most interesting point of the new church is a conventional breakaway from the old. The twenty-windowed tower is completely over the sanctuary. The lighting is concealed, and the church is heated with underfloor electric heating. The pulpit is also a breakaway from the old, it is light, movable and made from wood. The marble altar is low and naturally lighted from the twenty windows in the tower. The tabernacle which houses the sacraments and chalices was made in Dublin. The centrepiece behind the altar, which immediately attracts attention is the figure of the crucifixion. A white wooden figure of Christ mounted on a plain wooden cross quickly reminds all who enter of the foundations of Christianity. The blue reredos background is visible evidence of the triumph of the resurrection. The wooden figure of Christ and many other figures in the Church were made in Italy. The Church will afford seating accommodation for 400 worshippers. Messers. Norman Collisson of Bicester were the main contractors for the building. They were responsible for the work, right from the clearing of the site to the final completion. Messers. Collisson also made the pulpit and wooden cross behind the altar. The wrought iron gates at the entrance to the Baptistery were hand made by Mr. Camdray, a blacksmith of Brize Norton. He also made the railings outside he sacristy. The sacristy is rather lager than usual. The server’s dressing room is divided from the Sacristy proper by a large folding door. This was specially planned so that the room can be used for meetings when it is not in use for Church services. The name of the Church is “The Church of Our Lady of the Immaculate Conception.” All churches with Our Lady in the title can be abbreviated to St. Mary’s. The statue of Our Lady of the Immaculate Conception, in a white dress and blue veil with outstretched hands, will be missing from its place over he front entrance for some time. Financial commitments of the Church will not allow for another £300 to be spent on the statue. Music on the opening day was on a borrowed harmonium from the old Church. The new organ had not arrived.